Nations are a basic unit of human political organization and an important element of modern society. Whether it is in the form of a nation-state or a multi-national state, nation-building has remained an important project in the world. Nations are not the mere result of wars or any other historical accidents but a conscious design and statecraft of men and women with good vision and resolve. Nation-building is always a work-in-progress that needs constant nurturing and re-invention as it constantly faces new challenges. A nation-building project, therefore, is a process of creating tangible and intangible threads that hold a political entity together and gives it a sense of purpose. It is a complex process that often takes time and involves (1) building a political entity which corresponds to a given territory, and a common citizenship, (2) building institutions which symbolize the political entity and (3) building a common sense of purpose, a sense of shared destiny and a collective imagination of belonging. As an integral part of the modern world with both good and bad history, Ethiopia and Ethiopians have a very good reason to be concerned about nation-building. 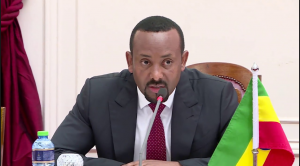 Although Ethiopia has a great record of protecting its political territory from external invasions, the nation-building and democratization process has been suspended for many years. Ethiopian citizenship identity is one of the oldest but least developed identity. There is still a hierarchy of being an "Ethiopian" based on geographic origin, skin colour and physical appearance. There are no institutions that represent the diversity and beauty of the Ethiopian people. In general, Ethiopians lack common sense of purpose, shared destiny and the collective imagination of belonging. The question "why the task of nation-building and democratization lagged behind in Ethiopia?" has always been a pertinent question. It is so not less because of the fact that Ethiopia has always been seen as a symbol of independence and unique country in Africa. Ethiopia is seen as a symbol of African independence not because Ethiopians are free people but because they have defeated an external invader over a century ago. However, the Ethiopian people are still living with multiple challenges and evils that they wanted but couldn’t able to get rid of. We still suffer from oppression under their own leaders, illiteracy is at its highest rate, drought, famine, are epidemic diseases is killing people on yearly bases, the list goes on. Therefore, the independence of the country and its uniqueness is both figurative and ascriptive. And taking pride in a century-old victory of our forefathers but failing to win our own battle should be shaming for all Ethiopians. In general, nation-building and democracy in Ethiopia have faced at least three major challenges: (1) the history challenge; (2) the institutional challenge; and (3) the leadership challenge. Some rulers have recorded some successes, such as keeping the country together in the face of many challenges, but these three challenges continue to be the major challenge for both nation-building and democracy in the country. Ethiopia has unsettled and very controversial historical legacies. The country, in its current shape, is the result of the expansionist war of the 19th century. The expansionist war left many nations and nationalities in the south with unhealed wounds. Today, those wounds are being refreshed and used to divide the country and the division has been a source of domestic tension which is undermining an effort of creating common nationhood. The other important aspect of nation-building is the building of common citizenship. Ethiopian citizenship identity is one of the oldest in the world but least developed. This is the result of the controversial historical legacies. Building a common citizenship identity is a difficult business when people are divided and have different hearings, readings and understandings of history. It is, in fact, a difficult business when people from the north don’t understand the reality the south, when there are implicit and explicit hierarchies between Ethiopians as citizens and subjects, as rest right holders and guild right holders, as the baptized and non-baptized. Those divisions and hierarchies not only created animosity between different groups but also blocked health and informed dialogue and communications between people. Bridging those divisions and blockages and developing a well-meaning, all-inclusive, non-ethnic and secular citizenship identity that all Ethiopians embrace equally is an important step to move the nation-building and democratization process forward. For this to happen, Ethiopians need to have a serious conversation on history, learn from it so as not to repeat its mistakes but also refrain from seeing self as a victim of history. It should be the main responsibility of all “citizens” to overcome the challenges posed by history on nation-building and the democratization process in Ethiopia. Ethiopians must create a national consensus on their past and move forward by sharing both its goods and bads. This has been a long-standing and unresolved issue and a very critical starting point for both nation-building and democracy in the country. In countries like Ethiopia, where a diverse group with competing and sometimes conflicting interests live, institutions provide a guarantee that all get what they want without discrimination. One of the greatest challenges of nation-building is the lack of those institutions. Whether nations are able to manage their political and social disputes peacefully, without lapsing into conflict, or sustain economic growth without creating huge inequalities, critically depend on the quality of the relevant democratic institutions. Institutions set rules, hire people with the right competence without biases and inspire public confidence by being transparent, fair and consistent. The performance of any organizations in the country should be measured based on these standards. Ethiopia is far behind on these regards and needs to create institutions that would help achieve the goals of building a democratic and sustainable nation. Although efforts are in place over the last few months, it is far behind what is needed. Supporting the initiatives of building institutions of democracy and democratizing existing government institutions should be the assignment and homework of all Ethiopians. Above all, Ethiopia faced the failure of leadership throughout its history. Leadership includes the personal qualities of integrity, honesty, commitment, and competence of individual leaders as well as the collective qualities of common vision, focus, and desire for development of the elites as a whole. There is no doubt that leadership is a critical factor both in nation-building and in democratization processes. Ethiopia has seen leaders who have seen themselves as a messenger of god all the way to those who see themselves as champions of only some sections of the population. Most Ethiopian leaders have a common tendency of ruling as a person than establishing an institution. They also have a tendency to build everything around themselves than strengthening the social cohesion between people. Neither nation-building nor democratization is complete without having a leader who understands the social fabrics of the Ethiopians people, the historical grievances, the economic and political challenges and have a very good mental and roadmap on how to deal with those issues. Ethiopia can not stand having a leader who is more interested in silencing opponents, than in pursuing justice. Ethiopians have been dreaming to have a leader who leads by upholding and respecting the rule of law, who have a sense of tomorrow for the country more than their own private bank accounts. Particularly over the last two decades, they have been dreaming of a leader who creates consensus on historical problems, unifies and leads them for a better tomorrow. Finally, it seems that Ethiopians have got that leader they have been looking for. Abiy Ahmed has a demonstrable sense of fair play and democratic tolerance; with ability and integrity and above all else see beyond the ostentatious pomp of his office time. Abiy has a vision for better Ethiopia than the one he inherited. In less than a year, he has also proved that he is an achiever, not a deceiver. This is already a very good indicator for the Ethiopian people to extend their support for his leadership. The Ethiopian people also need to learn how to own and use their leaders and most importantly how to produce more leaders with good leadership qualities. Providing the necessary critical support i.e correcting them on their mistakes and applauding and encouraging them on their achievements can speed up the process of nation-building and democratization process in Ethiopia. Nations are built by men and women who have the will and vision to accomplish greatness, not for themselves, their immediate families, friends and clans, but for their country. Finding people who can offer such leadership is the major challenge in nation-building and democratization process. The other challenge is garnering critical public support for those leaders and their visions with strong and dependable political and economic institutions. But having these preconditions fulfilled, it is almost certain that nation-building and democratization projects can succeeed. Ethiopia has been suffering from lack of these precondition for nation-building and democracy for years but finally convinced about the willingness of Abiy Ahmed to lead this process in the country. The popular support, although not yet concertized is encouraging. What Ethiopia needs and Ethiopians should focus on now, in my opinion, is to come to terms with each other on the controversial historical legacies. Ethiopians need to have an informed dialogue and reach consensus about our past and future. Ethiopia also needs institutions of democracy both to facilitate dialogue and informed discussions and ensure sustainable democratic governance in the country. Moreover, the country does not exist in isolation and nation-building must take account of the regional and international contexts. Ethiopia has always played an important role in African affairs. The country needs to continue building itself also to continue uptaking those roles in Africa while resisting the temptation of seeing herself as the guardian of other African countries. The promotion of regional integration, security and peace must be complemented by strategies emphasizing the creation of regional economic infrastructure, the expansion of economic opportunities, and the promotion of common democratic institutions and values. The promotion of democratization and sustainable development in African in general and in East African in particular, should be seen as part and parcel of Ethiopian nation-building and democratization process. More in this category: « What is transitioning in Ethiopia? What is transitioning in Ethiopia? The great political divides in Ethiopia: how easy to bridge? EAPRI aims to fill the gap between research, policy and practice not only by providing objective policy research that influence policy agenda and choices but also by strengthening capacity in policy evidence utilization and political commitment for its implementation. At EAPRI, we believe in the power of critical information in building a brighter future. Our focus is on the opportunities and challenges of attaining the development visions and goals of the nations of East Africa region. © 2018 TheEast African Policy Research Institute (EAPRI) All Rights Reserved.